UKDN Waterflow > Customer Experience > Brilliant water leak service – nothing to fault! When Gordon and Suzanne Spencer received a water bill and found that it was twice as much as previous ones, they knew they had a problem. 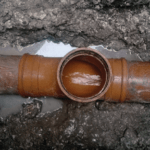 Their water company sent out an engineer and advised them there was a leak between the supply inlet and their detached house in Bracknell, Berkshire. The water had been escaping for some weeks, but because their water supply appeared not to be affected, there was absolutely no sign of it happening. The Spencers contacted their house insurance provider. It, in turn, commissioned UKDN Waterflow (LG) to investigate the water leak and come up with a solution. Accountant Gordon Spencer said: “The UKDN Waterflow (LG) engineer who came around was clearly very competent, always had a smile and filled us with confidence. Less than two weeks later, after further exploratory work by another UKDN Waterflow (LG) team, the same engineer returned to carry out the repair – what Mr Spencer called “a bit of magic”. A clever device called a mole was used to burrow a hole between the clean water inlet point and a small hole excavated near the front door. This allowed a new section of water pipe to be inserted, and connected to the mains supply, bypassing the break in the original pipe that was causing the leak. The job was done in a day. UKDN Waterflow (LG) just had to return briefly the next day to reinstate the block pavers on the Spencers’ drive. Mr Spencer said: “My wife teases me. She jokes that I am a bit of a Victor Meldrew character, who likes to find fault if there is one.